The Danish town of Silkeborg now holds the record for having the world’s largest solar heating system. The SDH plant of 156,694 m² (110 MWth) came online as scheduled in December 2016 after only seven months of construction. Municipal utility Silkeborg Forsyning intends to use the harnessed solar energy to meet 20 % of the annual heating demand of the 21,000 plant-connected users. The solar field was divided into four subfields to make it possible to set up the installation and hydraulics systems on this irregularly shaped piece of land (see photo). The former record holder is another installation in Denmark, in Vojens, boasting 70,000 m² (48.90 MWth) of installed solar thermal capacity. Both plants were turnkey deliveries from Danish collector manufacturer Arcon-Sunmark. In contrast to Vojens’s seasonal storage, the Silkeborg system is only equipped with daytime tanks, which are used to store energy from a combined cycle power plant consisting of two gas and one steam turbine. The 12,436 collectors with 12.6 m² of gross collector area were produced in the Arcon-Sunmark factory in Skørping and transported by lorry to the construction site one-and-a-half hours away. The Silkeborg plant was at the centre of a solarthermalworld.org news piece in August 2016. In a press release sent out on 9 January 2017, Arcon-Sunmark confirmed that the contract with Silkeborg Forsyning had been signed in February 2016 and construction had begun last May. A mere seven months of work translates into an installation and hydraulic linkage of more than 20,000 m² of collector area per month. The collector supplier’s wealth of experience allowed for strict adherence to the schedule and the field did come online as planned in December 2016. In the press release, Arcon-Sunmark said that it had built more than 100 solar heating systems above 1,000 m² since its foundation in 1988, which adds up to more than 1 million m². Arcon-Sunmark is part of Danish VKR Holding, a group with more than 13,500 staff across 40 countries. Their financial backing helps the company to aim for even bigger projects and spread the Danish success story of solar district heating around the globe. VKR Holding is about to enter into negotiations with Austria’s regional energy utility Energie Steiermark about a heat supply contract for an even more remarkable district heating plant in Graz. 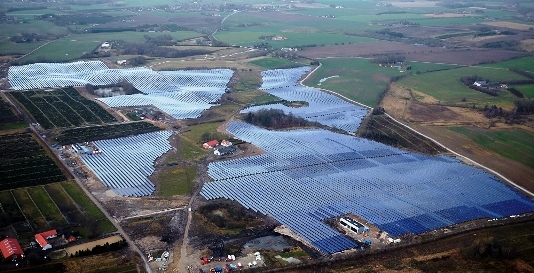 The Big Solar project developed by Austrian turnkey provider S.O.L.I.D. is said to include 450,000 m² of collector area (around 350 MW) and seasonal storage capacities of 1.8 million m³ to meet 20 % of the heat requirements of Graz’s DH network. Another strategic move to globalise large solar heat systems has been the establishment of a joint-venture together with Chinese-based Sunrain Solar Energy, the world´s biggest collector manufacturer. The contract for Arcon-Sunmark Large-Scale Solar Systems Integration was signed in May 2016. The new business aims at developing solar thermal solutions of considerable size in China. Rumour has it that the new business is going to set up an even more impressive Big Solar concept there.